The Golden Lion for the best artist goes to Christian Marclay this year for his video sampling installed in the Arsenal, entitled "The Clock". It required editing together thousands of sequences from art house films and television series in which countless scenes showing watches, grandfather clocks and wall clocks of all types and all eras follow one upon the other. 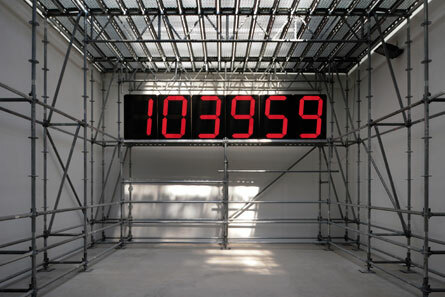 The work is also synchronised with real time so there's no need to check the time in this Biennial where time is already short because of constraints. Strangely, it is in front of this piece that critics, art dealers, collectors and amateurs alike take the time to follow the improbable story that flows from this chronological grouping of cinematic and television time markers. 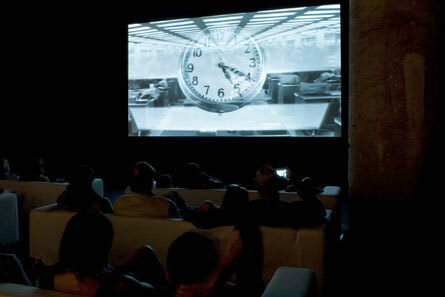 And the story, the meaning, springs mysteriously from the sequence that has been naturally imposed on the artist. The multitude of points of view prevails when all that counts in this work, which is as universal as it is timeless, is time, while voices regularly articulate the time passing, as though bored or in a rush. 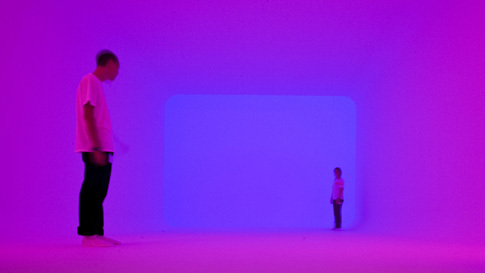 An impressive queue announces the work of the series "Ganzfeld" by James Turrell installed inside the Arsenal. The two mediators located on one side or the other of a monochromatic rectangle invite us to go through it to enter into a room where the coloured light illuminates only itself. The artist, as is his custom, has literally eradicated all the limits of the interior space, which consequently, has no depth. The effect is so convincing that he has placed another mediator to materialise the ultimate point of the space not to be crossed, which figuratively leads to the sublime. A spectator stretches out their arm to reassure themselves and their hand reaches into the background, which is also only light, where even the ground has been "erased". Another spectator exclaims: "Isn't that a fly there in the distance?" It is an insect that we don't dare to see for fear that the whole work will flip. But this incident with the fly only reinforces our will to follow such a sensorial experience, underlining as it does the fragility of a work that leads us to the level of the sublime. 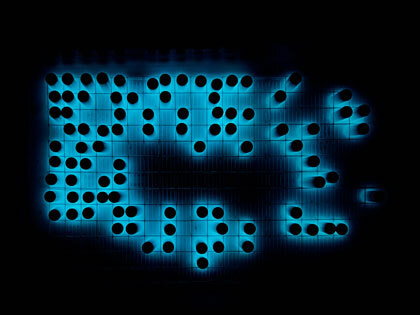 This year, it is Christian Boltanski who represents France, and the Pavillon Français is as lit-up as it is noisy, whereas the artist has so often invested the penumbra in silence. Several installations refer to each other where one can take one's "Chance". Portraits of newborns evolve before our eyes one after the other. An alarm rings out from time to time like that which announces the beginning of a play or an opera and the machine slows to stop on the person chance has chosen. But in what way will one's destiny be different, and why this person and not that? All of us have at some point or other asked ourselves these questions. Two digital counters change with each birth in green, as with each death, in red. All of us only pass through, furtively and are rapidly replaced. Lastly there is the game that allows one to "win the artwork" in Venice or online. All one needs to do for that is to click, but all we have is a minute chance of seeing a portrait that will not be a hybridisation of many faces. Are we not all born of such "assemblages"? There is a sound in the gardens of Venice that drowns out all the others at regular intervals. It is repetitive and comprised of sharps and flats, getting louder as one approaches the American Pavilion. 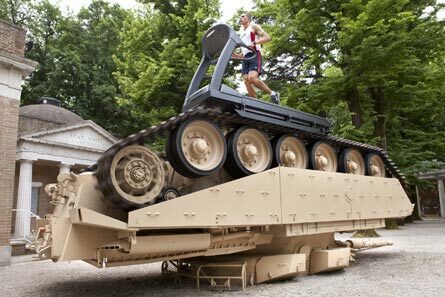 It is there, outside, that the artists Jennifer Allora and Guillermo Calzadilla have installed a tank. But it is upside down and it is real athletes that train on the treadmill that activates its noisy caterpillar tracks several times a day. The athletes thus dominate the tank as much as they control it. As for the assault tank itself, it appears as vulnerable as an upside down turtle. But what are the two artists, who are based in Puerto Rico, trying to say by associating these machines which have certain similarities in terms of how they function? What would the American government's message be with this Iraqi or Afghanistan desert-coloured tank, which seems to have been vanquished by a single being, as the one in Tiananmen Square was? We have to recognise that the Biennial, for whatever the state might be, is an affair of communication and that art dealers and collectors are doing business together behind the scenes without any prices being displayed anywhere. Numerous pavilions in the Gardens are entirely devoted to the work of a single artist, duo, or collective. This is the case of the Pavillon Coréen, which presents several installations, photographs and videos of Lee Yong Baek. But there is nothing at first glance that distinguishes the photographs comprising the series "Angel Soldier" from the video sequence of the same name other than a few barely perceptible movements in a world of artificial flowers. 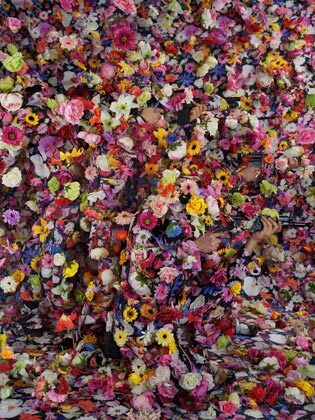 Yes, there is a movement here and there; someone is inside the image, at one with their floral environment. When one makes out a weapon of war - a gun - one understands who is hiding in the image: a soldier, and then another and still another whose camouflage outfits are not at all what one expects. The power of flowers in war is limitless, even though here they are being used for military ends. And these strange costumes are also present in the exhibition. The names they bear - Joseph Beuys, Marcel Duchamp, John Cage and Nam Jun Paik – bear witness to the many historical influences of Lee Yong Baek, though there is nothing surprising in that given the number of artists that claim to be followers of Duchamp or Cage. In Venice, there is no dearth of social, societal and environmental themes being addressed and it is at the Danish Pavilion that an image of Taryn Simon, whose work is particularly anchored in current events, can be found. It involves a photograph of a tank full of water, at the bottom of which we can make out metal containers holding radioactive nuclear waste. We learn by reading the text accompanying the work, that these are highly radioactive capsules and that the American site of Hanford conceals many others. It is a nuclear complex that was built in 1943 where plutonium was produced in significant quantities right up to the end of the cold war. This was before Fukushima, before Chernobyl even, when it was still possible to dump radioactive waste into the environment without informing anyone so as not to worry them needlessly. Taryn Simon informs us with this image, which is part of a series that makes visible what is not in her country, that Hanford is among the most contaminated sites in the US. We are compelled to ask, how many Hanfords are there in the making in this world? There is a Swatch logo on the official map of the Biennial because it is also in Venice where one must be for brands as well as museums, hence the growing number of collateral events in this international exhibition that seems to be impervious to the economic crisis. One, entitled “Outside itself”, organised by the DOX centre of contemporary art based in Prague, is but a short distance from the Arsenal. Federico Diaz has installed two industrial robots there that perform in his stead. No one knows the final shape of the sculpture they are making by meticulously assembling little spheres of black plastic. Not even the artist knows, who has only conceived the rules that control the fabrication process of the work by writing a few algorithms that have the value of "statements". The sculpture is thus made without the artist, but not without the spectators, as the robots are equipped with sensors that inform them of the surrounding activity in order to integrate the context of the work into the shape itself of this creation in progress. Joseph Beuys, in another time proclaimed that, "We are all artists", human or robot. Within Venice, there are even contemporary artists like Barry X Ball who have set up in museums. This latter has managed to place his works in the Ca' Rezzonico, which is normally dedicated to 18th century Venetian art. These creations, because they refer to the tradition of sculpted portraiture, tie in perfectly with the historical pieces on display. Even though they differ from the collections, notably by dint of their process of fabrication implemented by the artist. 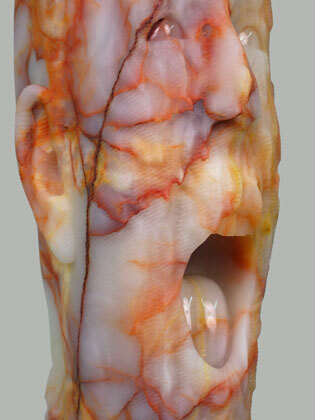 But the degree of realism, just like the perfection of the anamorphoses, the instantaneousness of the expressions, or the level of details in the motifs, is also due to the choice of using 3D scanners, modelling applications and digitally controlled milling machines. The contemporary quality of Barry X Ball's aesthetic however is really born of these strange assemblages and compositions that trouble us, as well as the marbles and onyx he selects for characteristics the ancients would have regarded as defects. Written by Dominique Moulon for MediaArtDesin.net and translated by Geoffrey Finch, August 2011.